Jurisdictions and businesses must be prepared to continue their minimum essential functions throughout the spectrum of possible threats from natural disasters through acts of terrorism. Continuity of Operations (COOP) planning facilitates the performance of State, local government and private sector services during an emergency that may disrupt normal operations. Continuity of Operations Planning (COOP) COOP is an effort within individual departments and agencies to ensure the continued performance of minimum essential functions during a wide range of potential emergencies. This is accomplished through the development of plans, comprehensive procedures, and provisions for alternate facilities, personnel, resources, interoperable communications, and vital records/databases. Ensure the safety of personnel and visitors. Contain provisions for the protection of critical equipment, records, and other assets. Contain provisions for an orderly response and recovery from any incident. Assure compliance with legal and statutory requirements. Provide for the ability to continue essential operations. Maintain efforts to minimize damage and losses. Serve as a foundation for the continued survival of leadership. COG ensures the continued performance of essential agency functions and support of the government entity during emergency or disaster situations. COG ensures the command and control of response and recovery operations as well as continuance of basic governmental functions. Key governance functions include legislative activities and the capability for elected officials to convene and operate in a safe location in accordance with local requirements. COG planning includes succession planning, delegations of authority, and alternate locations. Governments must ensure that elected officials and all branches of government are able to function during and after a disaster. 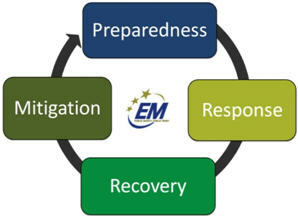 An ongoing process supported by senior management and funded to ensure that the necessary steps are taken to identify the impact of potential losses, maintain viable recovery strategies and recovery plans, and ensure continuity of services through personnel training, plan testing, and maintenance. Early Alert will work you and your team to develop strategies and methods to achieve and realize all of you continuity program needs!